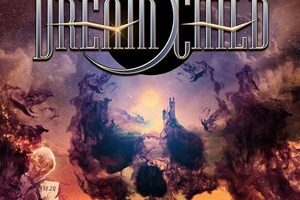 Developing out of a need to channel the best of Deep Purple/ Rainbow influences into something to be treasured in the current marketplace, guitar Craig Goldy assembled a killer lineup for the latest supergroup of sorts in Dream Child. The rhythm section of bassist Rudy Sarvo and drummer Simon Wright also ex-Dio members with Goldy, while rhythm guitarist/keyboardist Wayne Findlay has played with Michael Schenker, and vocalist Diego Valdez has his own original band from Argentina called Helker. Their debut album Until Death Do We Meet Again is a testament to the power of heavy metal, delivering on all fronts a record that makes memories of that 70’s era as well as the legacy of Ronnie James Dio. Speaking with Craig from his California home base, the man has poignant stories of his life, the pain, the struggles, and the success stories over the decades. Prepare to learn a lot more about Ronnie James Dio beyond the normal album talk in this extensive discussion – and please support Dream Child so that we can get more records and live shows on the horizon. Dead Rhetoric: Tell us how your passion for Deep Purple and Rainbow led to the formation of Dream Child – and what you wanted to prove through the development of Until Death Do We Meet Again? Craig Goldy: Good question! Deep Purple was my favorite band until Ritchie (Blackmore) left and formed Rainbow with Ronnie James Dio – so that became my favorite band and they were pretty much neck and neck. At the age of about 13 I think. The songs… I can draw like a photograph and I can paint. I say that those two things will come back into play later. Music makes me see things- and certain music didn’t make me see things other than like what’s called warm colors- yellow, brown, and red. When I was a kid I’d listen to the radio, I’d listen to jazz and rock, but I couldn’t stay on those stations as I’d listen to classical music. And then I heard “Burn” on the radio, I saw all different colors throughout the song in my head- so I knew I had to get this record. Jon Lord was classical based with his keyboards and ideas, David Coverdale had that gruff, bluesy kind of voice, Glenn Hughes sounded like a white Stevie Wonder – it was so unique and different, and then Ritchie Blackmore sounded like he was from a totally different planet. It had all the elements of music that I like all rolled up into one. And every song was great, and I could read along with the lyrics, which is why I like to have the lyrics there on my records for people to get on the very first listen. I had to learn how to play like Ritchie Blackmore, and then when he left my world was upside down until the day I heard “Man on the Silver Mountain” come on the radio. And then “Stargazer”, “Gates of Babylon”, and when I heard those songs I was good enough to start a band, and I was in search of a guy like Ronnie, who had that same passion and sing with inflection, because Ronnie had such a power that he was the voice of the people. That kind of music, he helped the downtrodden and the black sheep of the globe. We often felt alone and misunderstood, so he was our voice. The things that made him mad were the kind of things that made us mad, the things that made us sad made him sad- so it’s just like we kind of knew him. He was able to make friends with the people that heard his music, even though he hadn’t even met them yet. I wanted to in a very similar way be able to create music because of the impression it made on me. I came from an abusive family, hospitals where I had to get stitches, injuries and surgeries. I was living in a car that I was too young to own at the age of 14, a friend of mine’s father gave me a job that I was too young to have. I had a wind-up clock and little 7Up bottles filled with water that I would wash up on the side of the car, use it to shave, and I would have the clothes in the trunk of my car and I would go to work. I made a demo with the last $20 I made giving guitar lessons house to house – that demo ended up in the hands of Ronnie James Dio, and the next thing I know they are trying …. I get sad when I think of this, but Randy Rhoads died and Jake E. Lee took his place (in Ozzy’s band). They were looking for somebody to take Jake’s place in Rough Cutt, Wendy and Ronnie said they had to find this kid who lives in a car. How do you find a kid living in his car? They found me, they rented me gear, he got inspired to sit in on the audition and we did “Man on the Silver Mountain” and “Heaven and Hell” together, and an original song. We became friends that night, sitting on his couch, it was always like that for the two of us. And then when I became the guitar player for his band, it was more of a dream come true. His way with the fans, he showed me his methods, he pulled back the curtain and I got to see behind the curtain. He would take me to radio station meetings and record company meetings, and none of his band members were invited. Even when I was in Rough Cutt, he wanted to show me behind the curtain. That all came into play, he had such a big network, and I got a chance to work with people that engineered and produced bands like Led Zeppelin, Pink Floyd, John Lennon, Jimi Hendrix. That also played a part of what I wanted to put into this album. It almost tells a story from beginning to end. It’s almost autobiographical – Deep Purple they would go to so many different places, one minute they are playing rock, and then off beat funk, then a classical piece, it sounded like they were out on Mars. I wanted to incorporate a little bit of that into this album. The song called “Until Death Do We Meet Again”, really was when… Ronnie’s lyrics were really a little dark, the music was dark, but there was always a positive message hidden in there, somewhere. That song sounds very dark, but I believe in the afterlife, so I wondered why people would say ‘until death do we part’ when they would say their marriage vows. Shouldn’t it be ‘until death do we meet again’? I thought that would be a great song title, I waited around for the right time to write music to use that title. It ended up being the title track for the album – and Frontiers gave me a great opportunity to begin again. When we lost Ronnie, I was destroyed and had no interest in doing original music. I got an e-mail from them regarding the Resurrection Kings. Throughout my career I learned different recording styles with Ronnie. They gave me the freedom to record my guitars on my own the way I wanted to do them. I got the chance to paint with my guitar for the very first time – and this spilled into Until Death Do We Meet Again. Dead Rhetoric: You’ve obviously assembled a killer, veteran lineup and performed with Rudy Sarzo and Simon Wright in the past during the Dio years – how did Wayne and Diego come into the picture, and what qualities do you believe they bring to the table to make this material develop in that special way you envisioned? Goldy: A great question again too. Wayne Findlay and I had a band together a few years back. Once I started to get inspired to do original music again, I envisioned doing a Rainbow/Deep Purple mix of the 21st century. I was looking for people to work with, and Wayne and I hit it off. He’s a great producer, he can solo on keyboards like Jon Lord, he can play guitar- he was the second guitar and keyboardist for Michael Schenker. He had a name, he looked great, and he could sing. Some of the solo albums he did were filled with spectacular music. When I was on the phone talking with Serafino about how we were going to do this album, it came from a conversation with him where I bought all the Rainbow and Deep Purple albums. I would notice a lot of comments on YouTube about these records and people would say they don’t make albums like this anymore. I mentioned that to Serafino, and he said ‘well, can you?’ I said yes, and he asked if I could get him Rudy and Simon- I said yes. He asked me who I would write with- and Wayne was the first person I thought of. Plus people like Alessandro Del Vecchio and Jeff Pilson, I had worked with them in the past. My favorite thing to do though is to write with a keyboard player, because that’s my favorite core to begin with. Diego – a friend of Diego’s had e-mailed me a thing 7 or 8 years ago of a song Ronnie and I wrote called “Push”. It was chilling, it sounded like Ronnie had covered his own song. I got goosebumps, this guy is amazing. I got ahold of him and I told Diego how amazing I thought he was, but it was too early to do an album together – Ronnie had just passed. We stayed friends, and I told him one day you and I are going to do an album together. He was ready, this day had come – Serafino asked me who I would get to sing, and I told him I would send him that MP3. It was no question it had to be Diego- he had that similar power and inflections to his voice. In the lyrics what’s supposed to anger you, you hear the anger in his voice. A lot of collaboration went on, Ronnie was great to show me his methods of developing lyrics and melody lines and I used that a lot. He could go from clean to gruff and he sounds like a monster on this album. We had a joke together, because he was in Argentina at the time, we were sending MP3’s and he would ask if it was right. I would say no- it’s better (laughs). Dead Rhetoric: Were there any specific surprises, obstacles, or challenges that came up during the writing and recording of this debut Dream Child record – or do you feel that things went smoothly due to the obvious skill sets and direction this material took? Goldy: There you go, you kind of answered the question. There’s been a lot of obstacles and delays- just life. Once I know when the album is supposed to be delivered, I have a physical calendar and that’s what I write about, when the album masters are supposed to be delivered and what has to happen the day before that, and I fill that in. I work all the way backwards until present day- so that I know what needs to be done each and every day. Ronnie used to do that too – today we have to do this and that to bring us until all the way an album is done. Life doesn’t read those lists, so a lot of times things would happen that would cause delays. It was great- even Simon and I talked and I told him we really have to pull this one together because Serafino had been getting discouraged. He made a comment to Jeff (Pilson) that there must be a virus in Los Angeles, because all the musicians in Los Angeles simply just do not know how to deliver on time (laughs). I thought okay- I get it, I was currently working on an album that was way behind schedule. Simon told me we were working with a bunch of different people now, it just gave me confidence that we are doing this together and we are going to get this done on time. Simon, Rudy, Diego, and Wayne- once I told them this story, they were on board to give it our best and make a great record, but deliver it on time. They brought their A game, their work ethic, and it all just clicked. Dead Rhetoric: What can you tell us about the video shoot for “Under the Wire” – it seems like the band had a lot of fun doing those narrative scenes in an office setting to cut back and forth against the performance footage? Goldy: (laughs). That had a lot to do with Jamie Brown, the videographer and director. He created the atmosphere of fun- his crew had a lot of great guys. And then my guys, they are high caliber people who happen to have high caliber talent within. It created a whole atmosphere of camaraderie and fun – everyone had a really good work ethic. Jamie and I would talk from time to time- he would pick up on things in the lyrics that I didn’t pick up on for visuals. The thing I liked about what he did, there’s a lyric in “Under the Wire” called ‘caged for some might be fine’. Especially musicians, we are almost like wild animals in a cage- sometimes it’s okay to be domesticized, some of us can handle that but some of us can’t. They just don’t know how to have a family and be faithful to their wives and children, and be a rock star. But some can- and some are so over domesticized they are almost neutered. I learned from Gregg Giuffria how to grease the wheel and get things done by talking. What I learned about from Ronnie and my grandfather was that was part of their convictions – it wasn’t a sell job, they were so passionate that there was no way that wall wasn’t coming down or that mountain wasn’t going to be moved. They were so good and eloquent with their words. He would show Diego in a cage. He found a studio with a bunch of different sets. So there’s bars that look like real bars, hospital rooms that look like real hospital rooms. We set up a live band look, and the interrogation room, and cell. The first thought was us in an office room, and these cubicles. I was asking Jamie what are we doing in here? It seemed silly, and Jamie mentioned the lyric about paying dues. When you are first starting out, we are paying our dues. It was very clever, we were working at the cubicles paying our dues before we became successful. He wanted somebody on the copy machine- it doesn’t show it that great but nobody spoke up. And Rudy is such a great guy, he said that he would do it. My heart went out to him. Had they shown more of it, he turned more into this robot with the music, the way he did it in a humorous way, like a dance move in perfect time to the music. It was hilarious and the perfect thing. How do you make working at a copy machine cool? Well, you get Rudy Sarzo to do it. It was tongue in cheek, a lot of stuff in there- the same with the next video that’s going to be coming out on for “Midnight Song”. The album was pretty serious, once it gets towards the middle especially and creepy. We want to keep a little bit of a sense of humor in there somewhere.